Discussion in 'Tesla, Inc.' started by Joel, Feb 3, 2016. A bill introduced Wednesday by Rep. Aaron Miller would allow Tesla Motors to sell its electric vehicles in the state, although the car company doesn't use the standard dealership model. HB 5312 would strike the state's prohibition on direct sales from a manufacturer. The bill also provides a geographical protection so a Tesla manufacturer would not be able to sell within 10 miles from a traditional dealership. Mr. Miller (R-Sturgis) said it is a tough issue for constituents and lawmakers. And he said he is not looking to go after dealerships in his bill, which he said shows with the geographical protection. "It's a sensitive issue because dealers are wonderful business people back home. They are in almost every district in Michigan," he said. "And yes they are wonderful players in the community. They donate to charitable causes, they participate in local activities, they are involved in their communities. And I think it's fair to say that's why it's going to be a tough issue." The Auto Dealers of Michigan has fiercely resisted Tesla's efforts to sell directly, saying it should abide by Michigan law requiring it to sell through a franchised dealership. Tesla has mounted a major public relations offensive in the past several months, offering test drives of one of its vehicles to legislators and reporters. And it recently filed a request with the Department of State for a new and used auto dealer license as well as a repair facility license. Mr. Miller said although the bill will be "inevitably called the Tesla bill" it is about a change in philosophy as well. "Yes, Tesla is pushing this, everyone knows that. But to me it is about allowing a business model to operate in Michigan that currently is banned. It is that simple," he said. "What I would like to do is start a discussion. " The bill was sent to the House Commerce and Trade Committee, where Chair Rep. Joe Graves (R-Linden) said he is open to having a committee hearing on the legislation. He said he has met with representatives from Tesla previously, but has not yet seen Mr. Miller's bill. The Michigan Freedom to Buy coalition praised the introduction of the bill. "Technological innovation and evolving market forces are rapidly impacting the new car industry. Consumers want more choices and more convenience," Keith den Hollander, chair of the Michigan Christian Coalition, said in a statement. "They don't want to be forced by the government to buy their cars from a certain type of monopoly retailer. They want the freedom to buy the cars they want in the manner they choose." Terry Burns, executive director of the Auto Dealers Association of Michigan, said his organization would have to review the bill with its members first. He did not disagree that it is at odds where his group has historically come down on such issues. "It sure does go directly at the root of the franchise act," he said. "Of course those will be factors we will take into consideration as we review it." Good news Joel. Let us know if there is anything we can do to help. Good guys will eventually win. Sounds like a franchised dealer protection act. Not within 10 miles of a dealership? That means Tesla wouldn't be able to sell in any metropolitan area. What are the dealers afraid of that they can't have Tesla selling within 10 miles of any of them? I wonder how much it would cost to have the legislature pass a law prohibiting competition within 10 miles of my business. This shows that it really is a bi-partisan issue as well. This is good. Sounds like a franchised dealer protection act. Not within 10 miles of a dealership? That means Tesla wouldn't be able to sell in any metropolitan area. What are the dealers afraid of that they can't have Tesla selling withing 10 miles of any of them? Read more carefully. His bill would still prohibit a manufacturer from establishing a dealer 10 miles *from another franchised dealer of the same manufacturer*. 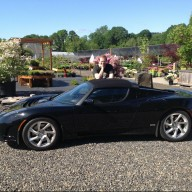 Tesla, with no franchised dealers, could put a store anywhere. The current law simply outlaws direct sales by manufacturers. Yes, thank you for the clarification. I hadn't read the actual bill, just the summary provided in the first post. With this clarification though, I think it would generate even more opposition from the dealer cartel than an exception for manufacturers who never had any dealers. This bill would allow the legacy manufacturers to open a sales center in a rural area which could attract business away from the dealers, putting GM in competition with its dealers for example, if it wanted to. The summary was from an article, not my words. I'm interested to see what comes of this. (b) to consider the high density of dealers in urban areas. I like that geographical provision, though I suspect that will become the piece that leads to this not happening. What I like about it, is that it shows the way to how manufacturers other than Tesla could get into the direct sales gig in the US. And though I consider the auto dealers association to be a source of competitive advantage for Tesla, it's not something that we should rely on as TSLA investors, nor is it good for the overall economy or country. Best for the overall industry and economy for auto dealers to prove their worth as an overall cost reducing function within the car manufacturing and delivery value chain (which would happen to the extent that car dealers survive without the additional help of franchise laws), or for them to go extinct as manufacturers take up the "burden" of selling and supporting vehicles. It's great to see progress being made on new legislation to allow direct auto sales in Michigan. The geographic approach is a novel one because it avoids the limits and obvious special interest exceptions Tesla has pursued in other states. It provides protections to existing dealers without limiting the number of locations or annual sales volume, nor does it single out alternative fuel vehicles for an exemption. California already has similar 10 mile provisions in place, so if it can work there it should be able to work here too. Of course the auto dealers will fight this, since they oppose anything that weakens their stranglehold on the market. Realistically speaking, even though automakers with existing dealerships could choose to open company-owned dealerships in rural areas, they are unlikely to since if the location was strong enough to support a dealership it would already have a franchise. I don't feel that the average consumer if given the choice would travel great distances just to deal directly with the manufacturer over visiting a local franchise. However, this legislation would open the door for that option if someone wanted to pursue it. Michigan does have the advantage of having a full-time legislature, so even if this legislation takes a lot of negotiations it should be easier to get done as opposed to a state like Texas where they only meet 3 months out of every 2 years. I do expect in the end the threat of legal action will lead to some sort of compromise that benefits Tesla. It's unlikely to be something as broad-based as this first bill, but at least things are finally in motion. "As you know I'm a Tesla fan and was annoyed by the passage of the anti-Tesla bill of 2014. I see that Aaron Miller has introduced HB 5312 as an attempt to fix that. I gave it a quick read-through; it looks like a reasonable first draft. Perhaps you would consider cosponsoring it? The main thing I see is that is currently wrong with it, is that although it corrects the damage done in 2014 it doesn't fix sections (p) and (q) that predated 2014. Those sections prevent Tesla (and others, of course) from opening service centers. Not much point in selling cars if they can't have warranty service done on them subsequently. Hopefully Miller would be open to striking or revising those sections as well." Section (q) should probably be amended as well, but leaving it as-is would not prohibit Tesla from servicing vehicles as part of a Class A dealership. The amendment to section (h) specifically allows them to operate a new vehicle dealership including providing warranty repair services in the absence of franchised dealers. This is precisely what Tesla has submitted an application for with the Secretary of State. Parts (p) and (q) are directed towards auto repair shops which are not part of a licensed dealership operation. Since Tesla's service center would be a component of a full sales operation, it would already have all the approvals they need. I suspected this might be the case but wasn't sure, so I just called out (p) and (q) as problematic. I'm still not sure they aren't: when I read (h), it permits warranty repairs, but says nothing about non-warranty work. And (q) specifically forbids (with no "warranty" qualifier) "a motor vehicle service and repair facility". Presumably Tesla wants to be able to do non-warranty work too, and I certainly want them to be able to. Perhaps I'm being too picky (but with the law it's probably better to be picky). I did a little more research and it looks like (q) is more significant than I first thought. The service center is a requirement in order to receive a class A dealer license, but they are certified separately from the dealership. Thus, in order for a manufacturer to own a dealership, they need to be permitted to both sell and service their vehicles directly. So yes, (q) will need to be changed as well in order to fully follow the letter of the law. An interesting and insightful reference I've not seen others make mention yet is an editorial essay from Harvard Constitutional scholar Noah Feldman, writing for yesterday's (4 Feb) Bloomberg. Link here: Let Them Have Teslas - Bloomberg View. He uses his expertise in the field to teach just why the Constitution's Commerce Clause is called a "dormant" one and why that characterization itself is of close to paramount importance to Michigan and Tesla. He also discusses and applies or rejects the outcomes of a half-dozen cases from 1978 on. It's a very good essay - 5-star recommendation to your personal reading list. New to the forums but wondering what happened with the bill. I see it was introduced but I don't see anything else. I wrote to my representative (Zemke) asking him to cosponsor it. I didn't hear back. GM killed it. Well, they steered it into the transportation committee rather than the commerce committee. Which effectively kills any hope.